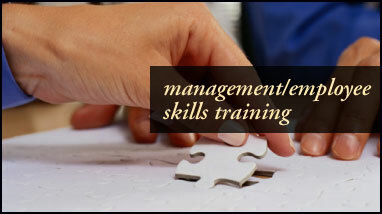 Management Development Training Courses with Peak Performance. Show your sales and management teams that they can accomplish more with less! Our Achieving the Impossible for sales and management teams challenges their perceived limitations and demonstrates that their potential far exceeds their current levels of performance. They will leave ready to take on the world! This critical skill workshop will provide you with powerful tools to help your people make major transitions and improvements in their performance. Forget the arcane hire and fire model of the past. You need to know how to actualize great performance with the people you have. Hey, No Problem©: �The 8 Essential Skills of Team Problem-solving"
If you thought problem solving wasn�t all that important, think again! Great teams have always been great problem-solvers. Teams that find solutions quickly win again and again. Hey, No Problem!© will teach your teams to understand problems as exciting challenges, to create solutions more quickly, and to think and act beyond the traditional group boundaries that lead to mediocrity. Peak Performance�s First Try Communication©, will have your people communicating effectively the first time. We teach teams how to clarify expectations, set direction, hear what�s said, and confirm plans efficiently. Then we practice the skills we teach through a series of innovative simulations and video taped activities. Start communicating effectively on the First Try! Builds on the Profiting from Change module to move from the awareness phase into the practice and perfection phase. This module reinforces the skills learned in �Profiting from Change�, and acts as an essential bridge to the implementation phase found in Change through Coaching. CST consists of three full days of interactive learning, skill building, classroom lectures, role-plays, group discussions, and powerful simulations. As part of the process, every attendee will also produce a detailed marketing strategy for their organization and set realistic sales goals for the coming year. It�s comparatively easy to merge two organizations. It can be a real challenge to bring two cultures together and form one that works for team effectiveness. Let us help you identify the essential elements of each culture, bring them together in a logical structure, get buy-in from team members, codify the vital components, and create action plans for getting the most from the new cultural components. If you want your new team members to show up ready to collaborate, you have to show them what you expect. These fun and exciting programs are a great way to introduce new employees into your culture and create a clear sense of expectations for teamwork, team communication, proactive contributions, and personal accountability. We�ll get them excited about your organization and they will leave thinking about all the ways they can contribute.